At ISCT we understand that continued education and growth are staples of the radiology industry, one in which everything is constantly shifting and evolving. It’s important that radiologists and technologists continue to adapt to these changes, to educate themselves on the latest trends, technologies, and innovations within the industry. There is no doubt that continuing your medical education is key to establishing yourself as a relevant, valuable member of the radiology community, and finding the time to advance your professional knowledge is essential. That being said, the life of a radiologist is a busy one, and it can be hard to find the time to clear your schedule and make time to attend conferences and earn the CME or ARRT credits you need. For two decades now, we’ve held an annual CT symposium that is not only valuable, comprehensive, and engaging, it’s one that is also accredited. 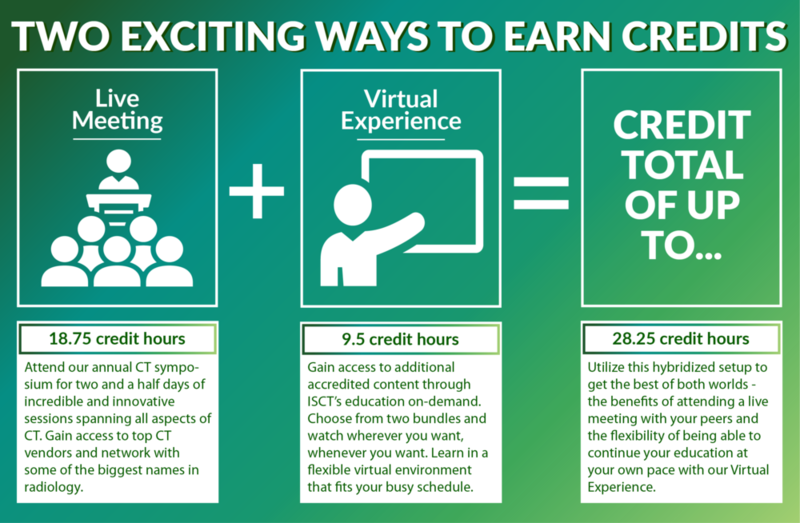 For 20 years attendees of the ISCT symposium have been able to pursue personal and professional growth in CT expertise through our symposium and earn CME or ARRT credits while doing so. For attendees of our 2018 symposium, it will be even easier to earn these credits with the addition of our Virtual Experience. There are two Virtual Experience content options for ISCT 2018 attendees to choose from based on their interests: our Technical Bundle and our Clinical Bundle. Both contain some of the most compelling and actionable content from our 2017 symposium and are valuable for members from all levels of the radiology department. Continuing your medical education is incredibly important, and sometimes it’s hard to weigh the pros and cons of doing so online with a flexible on-demand program or in person at a conference, where you’re able to expand your network of peers and gain access to top-tier faculty. We don’t think people should have to choose, which is why we’ve hybridized our CME opportunities for attendees of our 2018 CT symposium so that they can get the best of both worlds. Have questions about the accreditation for ISCT 2018 or how to submit for credit hours? Contact info@isct.org.